Posted May 14, 2017 by K & filed under Uncategorized. It might be tempting to dismiss Universal Design as just another fad. The fact is that it’s a trend that’s grown out of homeowners’ changing needs. Here are three things that drive this design movement. 1. Adult Children Staying Home Longer: Rather than getting saddled with debt while they are establishing their careers, more adult children are temporarily moving back home, but need some privacy and autonomy. 2. Aging Parents Moving In: Many older citizens are choosing to stay with their kids rather than move to retirement homes. That means homes need to accommodate their special needs. 3. More Homeowners Want to Remain in Their Homes: A lot of homeowners are planning for their own futures and want homes they’ll be comfortable in for years to come. Universal Design isn’t just about installing ramps or guardrails. It’s about making design changes that look good in your home while also accommodate changing needs. 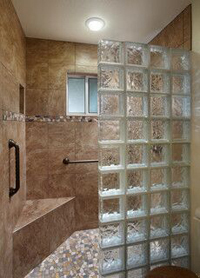 As an example, a walk-in shower not only looks great, but it also makes showering safer and more convenient because there is no need to step over a barrier to enter or exit. In a similar way, kitchens can be modified to eliminate the need for stooping or reaching high shelves—without compromising appealing design features. It doesn’t happen without some planning, however. That’s why it’s good to sit down with us and think through what your needs may be down the road so that you can come up with a plan that works for all of your family members. Reach out anytime! We’re here to help. Home > Pro Tips > Uncategorized > Make sense for you?